Hi, Thank you, friends and viewers. 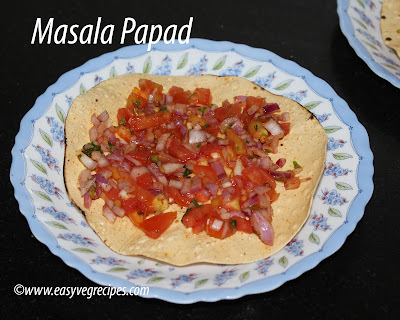 Today I will post how to make Masala Papad Recipe. This recipe I have tasted long back, approxmately 20 years ago. I tried it then itself and I made it twice or thrice only when we have a get together at home. After that it went out of my mind as new snack items came into the list. Last week suddenly this snack item struck in my mind, immediately I made it. Very simple and easy evening snack item. We can prepare it in different ways. It all depends on our choice of mixing different vegetables. Topping should be done only when we are about to eat them, otherwise they will become soggy. Chop onion, tomato, green chilly and coriander. In a bowl mix chopped onion, chopped tomato, chillies and coriander leaves. Then squeeze lemon juice and add in red chilli powder. Mix it well. We can add boiled peanuts, chopped cucumber also to the masala. Or add chopped carrot, boiled peas also. It all depends on ones taste and choice. On a stove top, roast a papad directly on the flame. Hold the papad with tongs, flip it regularly. See to it that the papad should not burn. If not serving immediately, keep the masala and roasted papad ready. Prepare the masala papad when guests ready to have them. Take the papad on to a serving plate, brush it with little oil. Spread a spoonful of onion, tomato masala on top of it. Thank you for visiting my blog. Hope you liked all my recipes. Feedback and suggestions are welcomed. For any queries please feel free to contact me through email. Can also Whatsapp me: +91 99667 00045.